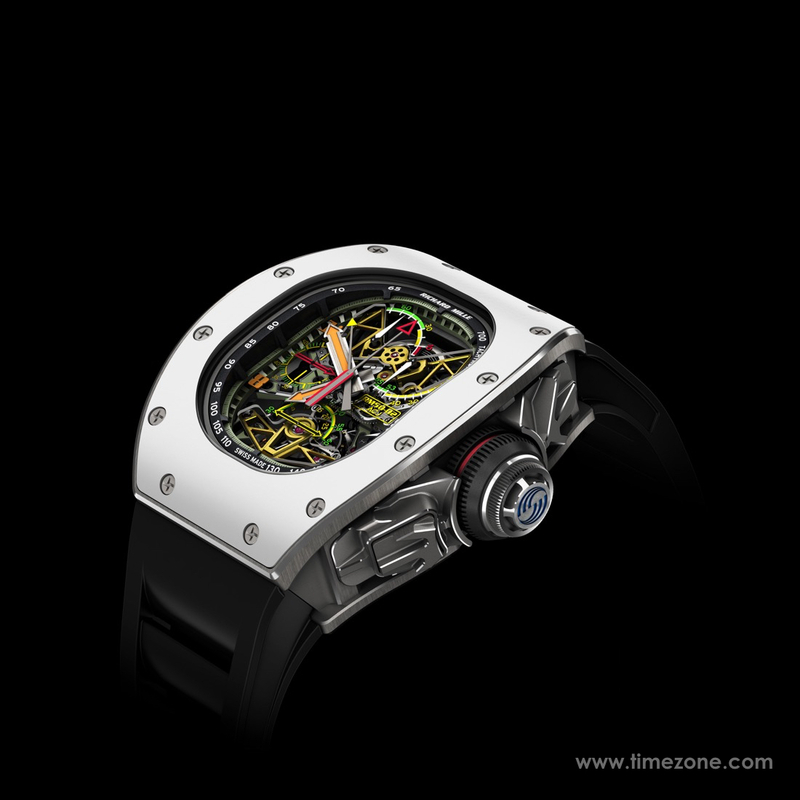 The Richard Mille RM 50-02 ACJ Tourbillon Split Seconds Chronograph is a natural collaboration between Richard Mille and Airbus Corporate Jets (ACJ). The exceptional timepiece is a parallel to the exacting attention to detail, advanced technologies and ultra-luxury culture of the finest jet maker. The RM 50-02 ACJ makes use of advanced, open worked design elements in the lightweight grade 5 titanium bridges and baseplate, along with an extensive application of skeletonisation to every possible area, offering significant weight reduction. A number of parts within the movement have been coated with a distinctive, special aeronautical coating normally used to protect engine and chassis parts from corrosion and environmental conditions. The end result is a visually breathtaking and dramatic view of the technical interior of the split seconds chronograph movement which also technical repercussions such as the elimination of the initial jump of the chronograph seconds hand during starting and stopping, with new split seconds components also in titanium additionally lowering the chronograph's energy consumption through the reduction of internal friction. 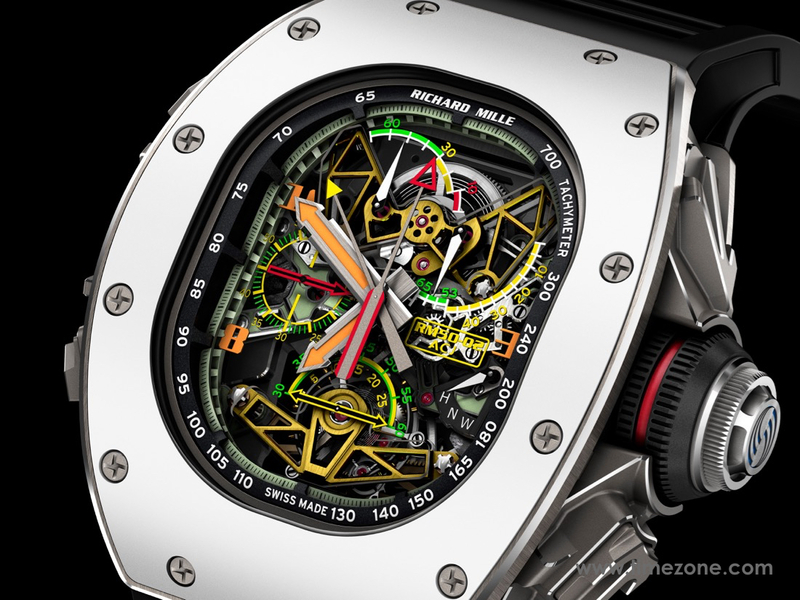 The new RM 50-02 tourbillon calibre also hosts a power reserve indicator (70 hours) between 11 and 12 o'clock, a torque indicator that supplies information about the tension of the mainspring allowing the optimisation of the chronometer function and a function indicator to show the watch's state in each of the positions for winding, neutral and Hand setting. The very distinctive and novel case shape in Titanium-Aluminum alloy (TiAl) with a secondary ceramic bezel was developed to mirror the outlines of an ACJ's typical window shape with a clearly visible, multi-layered hull structure surround. This Titanium-Aluminum is the same alloy as that used in the Airbus for its jet turbine blades, which must function safely under the convergence of high temperatures and high fields of pressure, thus requiring a very strong and highly stress resistant material. 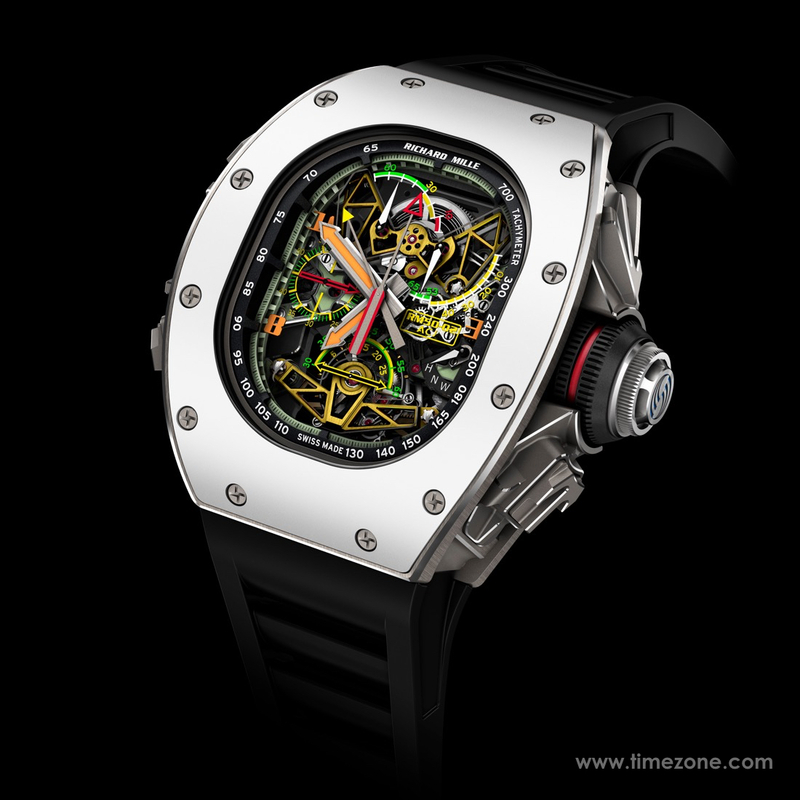 A premiere for the brand, this is also the first time the iconic Richard Mille screws around the outer edge of the bezel have been replaced by Torq set® screws with their distinctively shaped head slots, and a jet engine inspired crown bearing an engraved, wave patterned Airbus logo. Circa 70 hours (±10%), displayed on a numeric scale near 11 o'clock. The baseplate has been finished in grade 5 titanium, a biocompatible, highly corrosion-resistant and remarkably rigid alloy, which enables the gear train to function effortlessly. The alloy is 90% grade 5 titanium, 6% aluminum and 4% vanadium. This combination further increases its mechanical properties, which explains its frequent use in the aerospace, aeronautical and automobile industries. 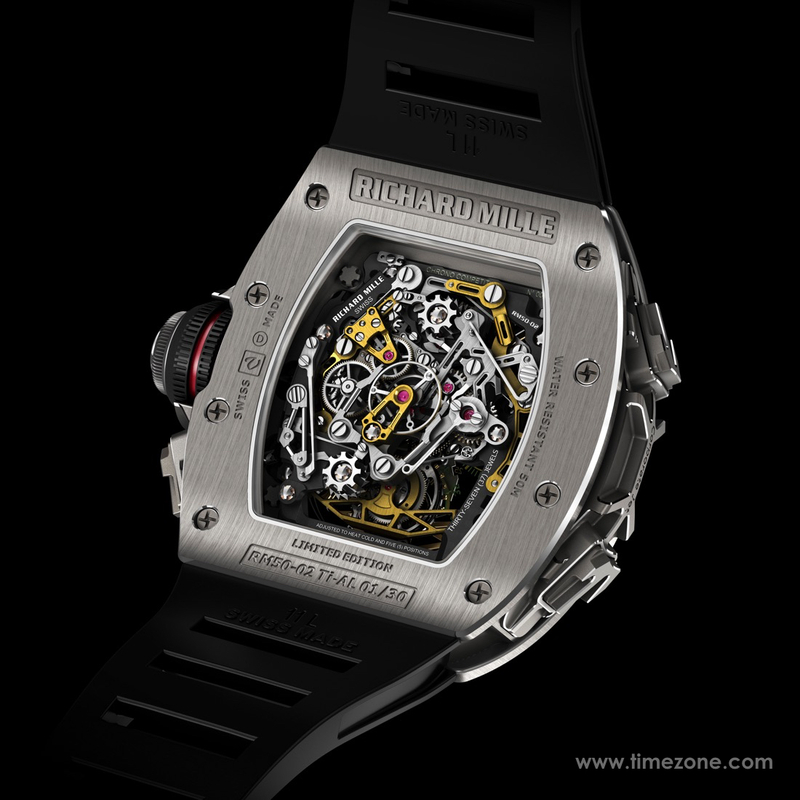 The baseplate of the calibre RM50-02 has been optimised to achieve an extreme weight/resistance ratio. One of the new characteristics developed for the split seconds tourbillon RM 50-02 is the virtually complete elimination of initial jumping in the chronograph seconds hand. Moreover, the development of a new generation of split seconds components meant that energy consumption of this function could be lowered by approximately 50 % through the reduction of friction within the movement, and the elimination of the inertial jumping of the chronograph's hands during stopping and starting. This was achieved by research focused on the working of the split seconds' arms. Operation: by depressing the pusher on the right at 4 o'clock, the user can stop the split seconds hand in order to read an intermediate time while the chronograph is engaged. Pressing the pusher again allows the split seconds hand to rejoin the chronograph, ready for the next measurement.